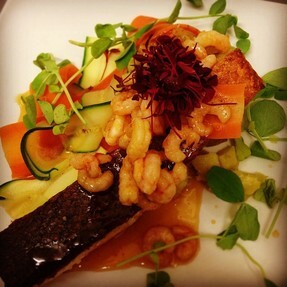 We serve both traditional dishes as well as providing a relaxed, unhurried experience. Great food and flavour starts with the freshest and best seasonal ingredients. We always buy the most ethical and best quality produce we can find. 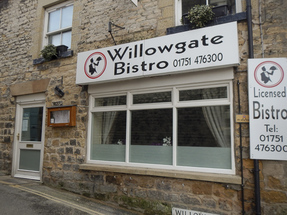 We only work with suppliers who are passionate about their product as we are ours so come and enjoy a relaxed meal with great food and drink in our beautiful bistro. we look forward to serving you soon. 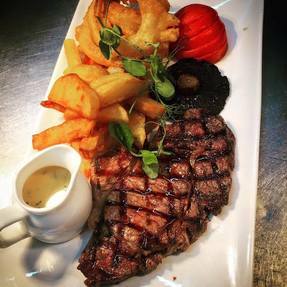 Get 2 Ribeye Steaks and a Bottle of House Wine for £40.00. Steak night is available every Thursday Night 5pm-9pm. Booking advised but not always necessary. Butternut Squash Veloute and Croutons. Smoked Mackerel Pate served with Melba Toast and Chutney. Goats Cheese, Red Onion, Wild Mushrooms and Spinach Vol-au-vent with Dressed Salad. Smoked Duck Breast with an Orange Glaze and Pepper Salad. Pan Seared Scallops with a Lime, Cucumber and Baby Leaf Salad. Pigeon Breast served with Parsnip Puree, Beetroot Crisps and Wild Mushrooms. 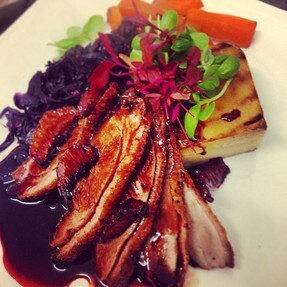 Lambs Liver served with Bacon, Onions and a Rich Red Wine Gravy on a Mustard Mash Potato and Seasonal Vegetables. Chicken Breast with Chorizo, Baby Carrots Braised Red Cabbage, Dauphinoise Potato and White Wine and Garlic Sauce. Oven Baked Halibut with Lemon Grass, Mussels, Sea Greens and Cucumber Vinaigrette. Blue Cheese Twice Baked Souffle served with Roasted New Potatoes and Dressed Salad. Seabass Fillet with a Quenelle of Crab, Wilted Greens and Garlic Mousseline Potato. Slow Braised Belly Pork with an Apple Puree, Garden Greens a Sage and Onion Mash Potato and Red Wine Jus. White Chocolate Panna Cotta with Lemon Curd and Tuile Biscuit. Chocolate Fondant with Chocolate and Baileys Ice Cream. Sticky Toffee Pudding served with Toffee Sauce and Vanilla Ice Cream. Trio of Homemade Ice Cream with Orange Shortbread. Trio of Cheese Board with Chutney, Fruit and Cheese Biscuits.